Hey everyone! Thought I would share one of my monthly club projects with you all! This is so much like the sunsets that I am seeing here in Southern Utah! I wish you could all be here with me! It is amazing! Stampin’ Up! is treating us like royalty and the weather is incredible! This project is created with a card base of Early Espresso cardstock. The second layer is Baja Breeze and it was run through the Woodgrain Embossing Folder with the Big Shot. The next layers are sponged with Pumpkin Pie, Daffodil Delight, and Old Olive. The Bonsai tree is stamped in Early Espresso. 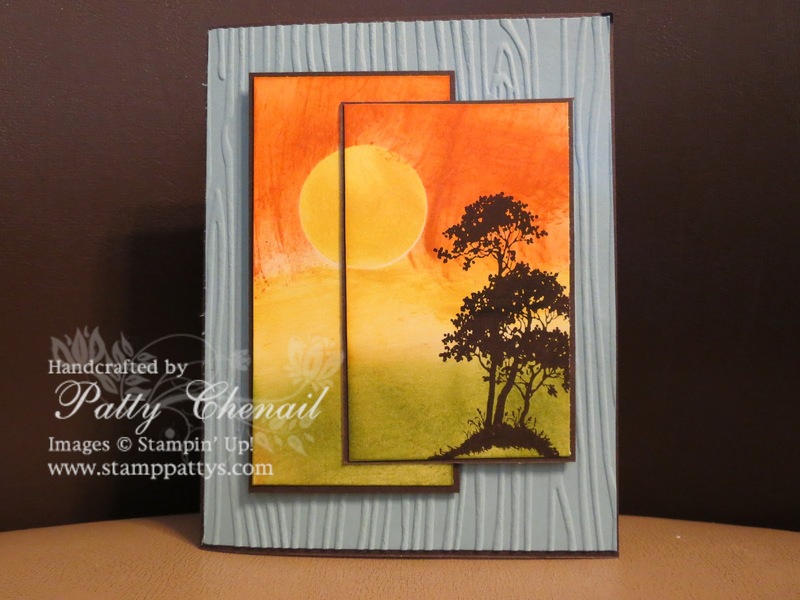 The image is from the stamp set called, Serene Silhouettes. Stay tuned to the blog because I will start sharing my Founder’s Circle details with you tomorrow!